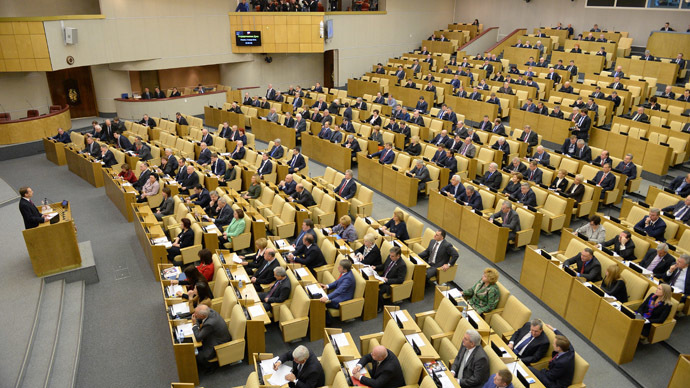 The State Duma Committee for Constitutional Law is putting forward a bill which would allow the authorities to ban the activities of foreign or international groups that are recognized as “posing a threat to the nation’s security or defense ability. The head of the committee, MP Vladimir Pligin (United Russia) told the TASS news agency that it would recommend the legislature hold the first hearing on the motion on January 20. The initiative, dubbed by the mass media as the “Undesirable Groups Bill” was drafted in late November last year by two opposition lawmakers, Aleksandr Tarnavskiy from the leftist party Fair Russia and Anton Ishchenko of the nationalist Liberal-Democratic Party of Russia. “Today we live in a period when some foreign organizations behave not in the best way. The reasons may vary, some act on requests of intelligence services, others have different motives. Sometimes it is even economic, they create problems for Russia in order to cheaply purchase Russian assets,” MP Tarnavskiy said as he presented the bill to the parliamentary committee. “The main objective of the motion is to demonstrate the existence of groups that are unfriendly to Russia,” he added. However, the lawmaker refused to give any examples, saying that he hoped that the new bill would have a preventive effect. The main idea behind the bill is that the Prosecutor General’s Office together with the Justice Ministry and Interior Ministry should create an official list of “undesirable foreign organizations” and outlaw their activities in the country. After the group is recognized as “undesirable”, the authorities would freeze its accounts in Russian banks and impound any property on Russian territory. The organization would also be banned from opening offices, branches or affiliate companies in Russia, and barred from collecting donations or distributing propaganda. The bill also stipulates that individual foreign members of the banned groups would be banned from entering the country. The bill suggests that Russian citizens found guilty of assisting undesirable foreign organizations could be punished with fines of between 10,000 and 100,000 rubles ($160 - $1600 at current rate).Repeated offenses could carry criminal responsibility with a maximum of 8 years in prison. However, anyone who voluntarily quits working for an undesirable foreign organization must not be criminally prosecuted, the draft reads. The bill on “undesirable groups” is in line with the “Foreign Agents Law” introduced in late 2012. According to this act, all NGOs who receive funding from abroad, and that are even partially engaged in political activities, must register as foreign agents or risk substantial fines. In November last year the “Foreign Agents Law” was expanded with a bill that makes it illegal for Russian political parties to receive sponsorship, or enter any business deals with NGOs with “foreign agent” status.